As a Napoleonic scholar (not kidding), it is fitting that I have always loved Napoleons, otherwise known as mille-feuille pastries. I remember being pre-school-aged, and begging for Napoleon’s at our local grocery store—in retrospect, a Kroger’s with a fairly impressive bakery department. I have not seen a tray of Napoleon’s in a supermarket bakery case in years. I have never referred to a Napoleon as a mille-feuille (literally a thousand leaves), because let’s face it: Napoleon is a far more entertaining and evocative name for a cream-filled pastry. A catered event I attended over the weekend finished off with trays of pastry deliciousness, including my long-lost favorite the Napoleon, the rekindling of my love prompted the question: Why Napoleon? To the uninitiated, a Napoleon consists of sheets of pastry alternating with [generally] two layers of pastry cream custard. This neat architectonic block is then topped with a sheet of fondant that combed with chocolate or fruit swirl. À la the image above. Under the name Mille-feuille, the treat was first recorded (according to Wikipedia) in mid-seventeenth century France; in the eighteenth century, Marie-Antoine Carême considered it an ancient recipe. Carême was an early chef of French haute cuisine who served members of the upper class and aristocracy between 1798 and his death in 1833 (by which point he was living in Germany). Famous employers include Talleyrand, the Viennese Court, the British Embassy, Czar Alexander I, the Prince Regent (George IV), Princess Bagration, Lord Steward, Baron de Rothschild and Napoleon himself. But back to the Napoleon. 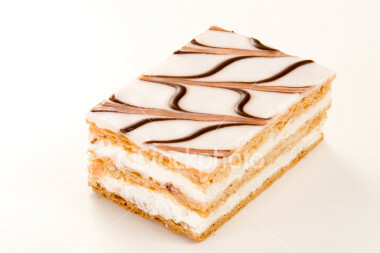 Apparently there was an early French association between the mille-feuille and Naples, making it a napolitain pastry. The fortuitous connection to the emperor was made later, and tended to stick. In the bible of French cooking, Larousse Gastronomique, the Napoléon as discussed is not mentioned, although a rather monumental and out of date Napolitain Cake is listed, with a passing note that while the cake itself is not often seen today, small biscuits known as fonds napolitains are still made, decorated with butter cream or jam (page 702). According to the description and subsequent recipe for a full-blown Napolitain Cake, the Napoleon pastry under investigation resembles certain elements of the recipe, attributed to Carême (along with several other non-dessert à la napolitain dishes). Larousse does have a separate listing for mille-feuille (page 667), where it states that the dessert is a late nineteenth-century creation. So that is confusing. Although a clear connection is not made, there is an implicit association with the entry on Napolitain Cake. The mille-feuille description is textbook (which is good, because Larousse pretty much is the textbook). It appears well-established that the Napoleon is a misnomer for Napolitain, likely popularized by the coincidence of Napoleon Bonaparte’s rise to glory in the same period that Carême was popularizing dishes à la napolitain across Europe. At the same time, it is clear that Carême and his art were engineered to feed directly into the new luxury of the Napoleonic period after the Revolution. The architectonic design of his pastries connects to the solid architectonic Empire style established by the state during this period. 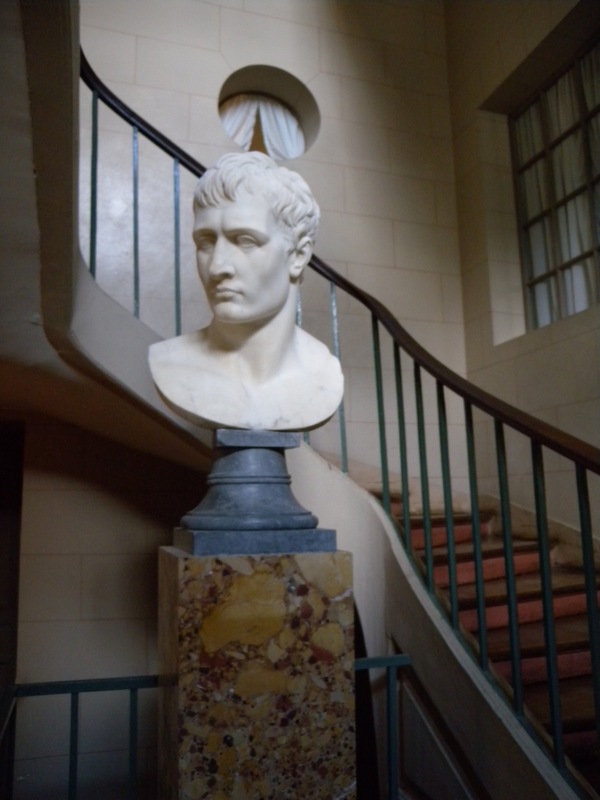 Bust of Napoleon Bonaparte located at Malmaison. Photo by author. You see, it all comes together. Napoleon generally did not concern himself much with the finer aspects of dining, much like sleep it just did not top the list of important daily ventures. Although if you want to hear long-winded remarks on his acknowledgment of pomp, presentation, art, architecture and social practices in the wielding of power and establishment of political legitimacy, and the role of Empress Josephine in the finessing of these design matters… you know where to find me. I like your take on the Napoleons…pretty much along the lines I was looking for! Seriously, I have been looking for a hopeful connection between the pastry and the emporer! Thanks for sharing your take on it!